All 22 people travelling in a small passenger plane that crashed in Nepal were killed, police say. The Tara Air Twin Otter plane took off on Wednesday from Lamidanda Airport, 162 km (101 miles) east of Kathmandu and was heading to the capital. The wreckage was found on a hillside in eastern Nepal's Himalayan foothills. A police spokesman told the AFP news agency that 20 bodies had been recovered, "but we can be sure there are no survivors". The plane had "broken up completely" and the wreckage was spread over 200m of dense forest, Bigyan Raj Sharma said. The plane was found early on Thursday after the search resumed at first light. The operation had been suspended later on Wednesday due to heavy cloud cover and fading light. The plane was carrying 19 passengers and three crew. Tara Air said one of the passengers was an American citizen. Most of the others on board are believed to have been Bhutanese pilgrims returning from a trip to a Hindu temple. 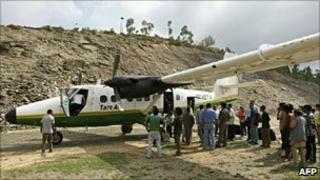 Aviation accidents are not uncommon in mountainous Nepal. In August, a plane heading for the Everest region crashed in bad weather killing all 14 people on board, including four Americans, a Japanese national and a British national.